Best known for her decades-long role as Myrtle on the soap opera “All My Children” and also remembered for her portrayal of Gertrude in Laurence Olivier’s filmed version of Hamlet, Eileen Herlie had a distinguished career as a stage actress in London and on Broadway as well. Though mainly seen in plays, she surprised audiences with her singing in the musicals Take Me Along (1959), in which her performance earned her a Tony nomination, and All American (1962), in which she shared the stage with Ray Bolger. Born in Glasgow, Scotland, in 1918, she had thespian ambitions early on, joining the Scottish National Theater and then moving to London, where in 1946 she made her mark in Jean Cocteau’s play The Eagle Has Two Heads, in which she impressed audiences and critics with a mesmerizing, longer-than-twenty-minute monologue. She was a familiar presence in London’s West End during the 1940s and 1950s. For his famous 1948 film of Hamlet, Laurence Olivier chose Herlie to play the mother of the noble Dane, played by Olivier – even though she was eleven years his junior. Her youth lent credibility to the Oedipal aspect of the relationship between Hamlet and Gertrude that Olivier wished to stress. On Broadway she would reprise her role as Gertrude, with Richard Burton as Hamlet, in the famous 1964 production directed by John Gielgud, also filmed. But it was in 1955 that Herlie made her Broadway debut, playing Irene Molloy in Thornton Wilder’s Tony®-winning comedy The Matchmaker, which became the basis for the musical Hello, Dolly! She had already performed in the play in Edinburgh and London and traveled with the production to New York. She later starred as Emilia Marty in Makropoulos Secret (1957) and in Epitaph for George Dillon (1958) before showing Broadway audiences that she could sing as well as act. In 1959, she was one of the stars in Bob Merrill’s musical Take Me Along, based on Eugene O’Neill’s play Ah, Wilderness!. Jackie Gleason starred as Sid Davis, Herlie as Lily Miller, and Walter Pidgeon as Nat Miller. Herlie’s performance, and the charming flutter of her singing voice, earned her a Tony® nod for Best Actress in a Musical, while Gleason won the Tony® for Best Actor in a Musical. RCA Victor issued an original cast album of the show. Herlie returned to musical comedy in 1962, playing Elizabeth Hawkes-Bullock in All American, which also starred Ray Bolger (the Scarecrow in the classic movie of The Wizard of Oz) and featured a book by Mel Brooks and music by Charles Strouse. 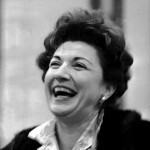 Her duet with Bolger, “Once upon a Time,” became the work’s best-known tune, with a version covered by Tony Bennett. Herlie’s later appearances on Broadway were confined to plays, among them Photo Finish (1963), Halfway up the Tree (1967), and Emperor Henry IV (1973). Herlie’s film credits include Hungry Hill, The Angel with the Trumpet, The Story of Gilbert and Sullivan, She Didn’t Say No!,Freud: The Secret Passion, and The Sea Gull. She began her more than thirty-year tenure on the television soap opera “All My Children” in 1976, playing Myrtle Fargate, a straight-talking dispenser of advice to the townsfolk of Pine Valley. For her work on the show she was nominated on three occasions for Emmy Awards for Outstanding Actress in a Supporting Role in a Daytime Drama Series and once for Outstanding Supporting Actress in a Drama Series. She continued to play Myrtle into the year of her death, 2008.